timebymail ... High Quality Precision Watch Parts Tools Shop wholesale feedback Tudor 72033 Prince 27.9mm Replacement SAPPHIRE Watch Crystal Watch Tools Watch Crystals Leather Watch Straps Omega Dynamic Straps Military Watch Straps Stainless Steel Straps Rubber Watch Straps Nylon Watch Straps Casio Watch/Straps Swatch Watch Straps Watch Clasps Buckles Watch Parts Watch Hands Watches Watch Crowns Watch Movements Watch Circuits Watch Coils Wholesale Items Clock Parts Tools About Us Feedback Condition - New Size - 27.9mm (top) 27mm (bottom) Thickness - approx. 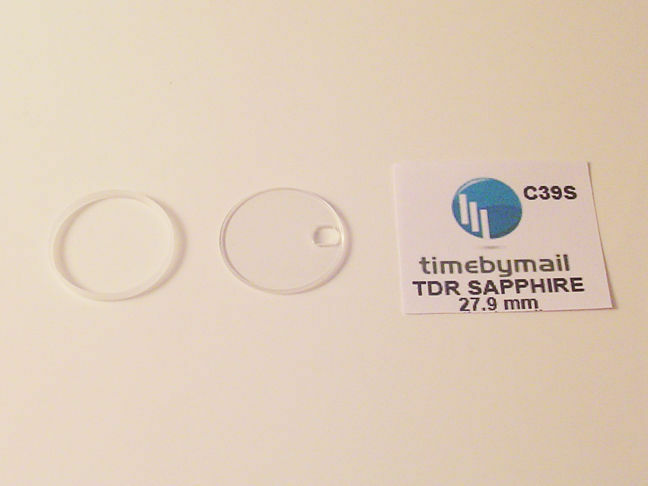 2mm Material - 100% Sapphire Use - Replacement Model - Tudor Princess 72033 Etc. Date Window - 5.8mmX4.6mm One Day Dispatch Free UK Postage Next Day UK Postage Option This NEW replacement 100% SAPPHIRE crystal is designed for the Tudor 72033 ranges which require a flat glass with date window. It measures 27.9mm top diameter, 27mm bottom diameter and is made of quality Sapphire, The crystal has no magnification and has a clear view unlike some cheaper models on sale. The glass comes with the usual plastic gasket. Could you please confirm your address as soon as possible if it is different to and Paypal. After payment is made we will post to your address (next day) so if it is incorrect then please let us know as quickly as possible.